Ahhhh, finally an interview with Michael that gives a bit more information about his family background and daily life. Once again, I'm pleased to learn that he's an ok dude... an up and coming actor to take notice of with abated breath. 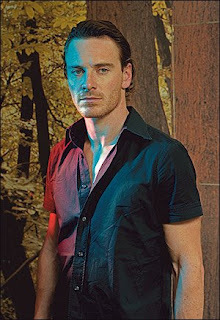 Besides this lurvely new photo of Michael, below I highlight just a few notes from the lengthy interview Michael Fassbender: on playing Bobby Sands, an interview that will definitely be quoted from for unique tidbits about Michael preparing for 'Hunger'. I cannot stress enough how much fun it is to be a fan of Michael Fassbender at this moment because it's great to see a nice talented guy get a few breaks and be well on his way to superstardom. It's great also to read this interview and learn about the things he does that I have in common with him. I hope he stays grounded and busy, and that we fans continue to get intriguing, informative, and mature interviews with him. I shudder at what kind of silly questions the US media/tabloids will ask him eventually.